One result of the Second Continental Congress was the formal Declaration of Independence signed on July 4, 1776. 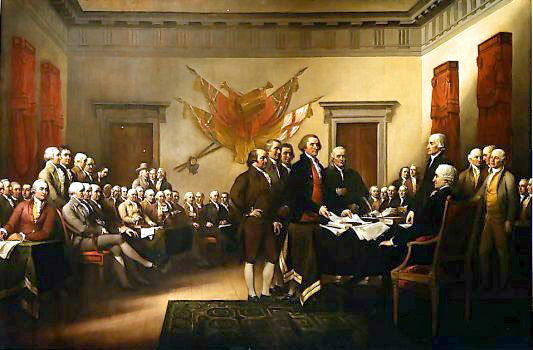 The committee created by the Second Continental Congress to write the Declaration consisted of two New England men, John Adams of Massachusetts and Roger Sherman of Connecticut; two men from the Middle Colonies, Benjamin Franklin of Pennsylvania and Robert R. Livingston of New York; and one southerner, Thomas Jefferson of Virginia. Jefferson took on the task to write the declaration, though he thought Franklin should do it. Franklin declined, but did make a few changes to the document. The Congress would not approve the declaration until the clause calling for an end to the slave trade was deleted. John Adams knew that the signing would be commemorated and celebrated year after year. And he was right. The 4th of July, not the date of British surrender, became America's "Independence Day." Thomas Jefferson, primary author of the Declaration, wrote later (1823) - that the other members of the committee "unanimously pressed on myself alone to undertake the draught. I consented; I drew it; but before I reported it to the committee I communicated it separately to Dr. Franklin and Mr. Adams requesting their corrections. . . I then wrote a fair copy, reported it to the committee, and from them, unaltered to the Congress." The Lee Resolution for Independence was signed on July 2nd, 1776. The signing of the Declaration of Independence followed on July 4. Many changes were made from Jefferson's Rough Draft, changes which Jefferson was critical of. He was particularly unhappy about the deletion of a passage attributing responsibility for the slave trade to King George. "I wish sincerely, as well for the honor of Congress, as for that of the States, that the Manuscript had not been mangled as it is. It is wonderful, and passing pitiful, that the rage of change should be so unhappily applied. However the Thing is in its nature so good, that no Cookery can spoil the Dish for the palates of Freemen."